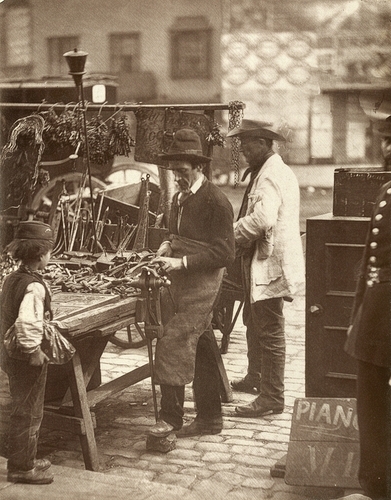 "The owner of the stall in the accompanying photograph had, however, a different story to tell concerning keys. He possessed some keys which he would gladly sell for twopence, and he reminded me that this branch of his business was subject to certain restrictions which made him at times "lose a job or two." If keys were sold and made indiscriminately, burglars, and in fact all thieves would find easy access to other people's property. Hence certain laws were enacted with the object of preventing anyone buying keys save the rightful owners of the locks they were intended to fit. A locksmith is, therefore, not allowed to make a key from an impression. Either the lock itself must be brought to him, or the locksmith must be allowed to enter the premises and fit his key into the door. Otherwise it would suffice to obtain an impression of a key on a piece of soap or wax for a thief to procure himself a similar one, and thus open the lock protecting the coveted treasure. "Further, it is illegal for a locksmith to lend a bunch of his keys; and, in a word, before exercising his art to open locks he must assure himself that his services are not required for any dishonest purpose."